Located at 21 Widmer Street (Adelaide & Widmer), Cinema Tower is a new condo project developed by the Daniels Corporation. Clad in steel and glass, Cinema Tower is a dramatic 43-storey tower featuring a striking six storey podium and unique curved roofline. 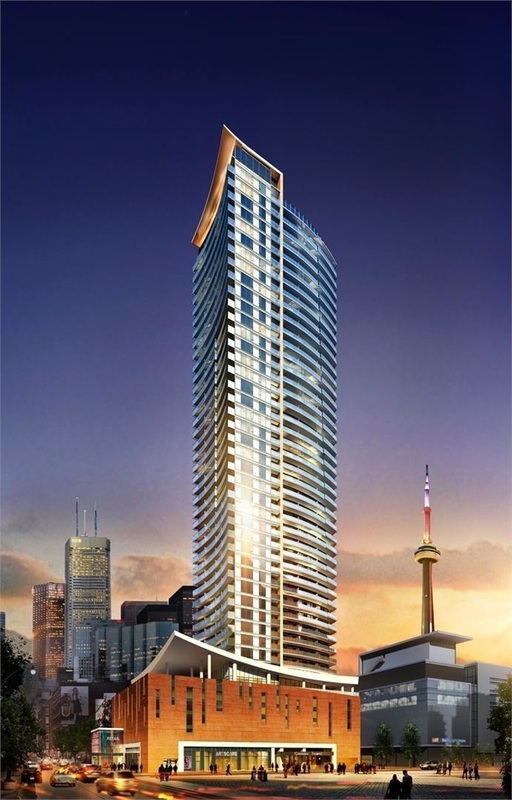 The building is ideally located in the heart of Toronto’s World Class Entertainment District and just moments from fine dining, theatres and shopping. The lobby will feature a luxurious two-storey Lobby, designed and furnished by HOK’s Award-Winning interior design team, incorporates reclaimed artefacts and materials to pay homage to the history of the surrounding downtown neighbourhood. The exterior entrance of the Lobby is framed by a stunning sculptural metaphor – “Strata”. Created by internationally renowned artist Peter Powning, “Strata” will act as a canopy over the entrance and will fuse an eclectic grouping of artefacts cast in bronze and illuminated aquifer veins made of reflecting slumped glass.